The location of this chalet offers great possibilities for all seasons. In winter time, the nearest ski lift is just 100m away. During the summer and spring there is a great adventure and mountain biking park nearby. 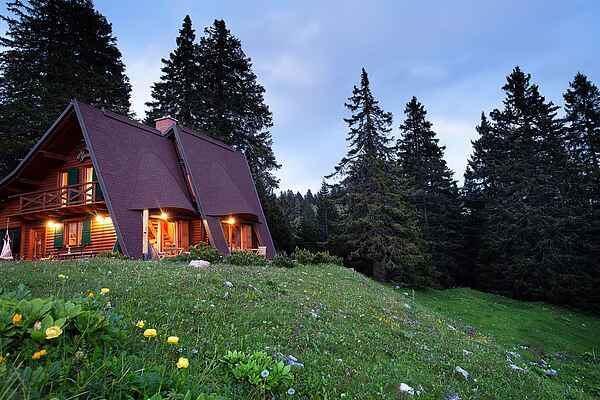 This semi-detached chalet is situated 1500 m above sea level, on the edge of a forest and in a well-known Slovenian ski resort. It features stunning views of the valley bellow and surrounding Alps with mount Triglav - the highest mountain in Slovenia. The chalet is fully equipped with solid wooden furniture. The ground floor features a living room, an open kitchen, an open fire for heating the house, a bathroom and a private patio. The first floor features two double bedrooms, a balcony (accessible from both rooms) and an additional toilet. There's an outdoor storage shed for sports equipment and a spacious picnic area. The first floor is accessible by steep stairs only (barrage for children on the top of the stairs). In the case of heavy snow falls the access to the house is possible with the snow mobile only; car can be parked in the parking space approximately 1 km from the chalet (the lift is organized by the home owner).